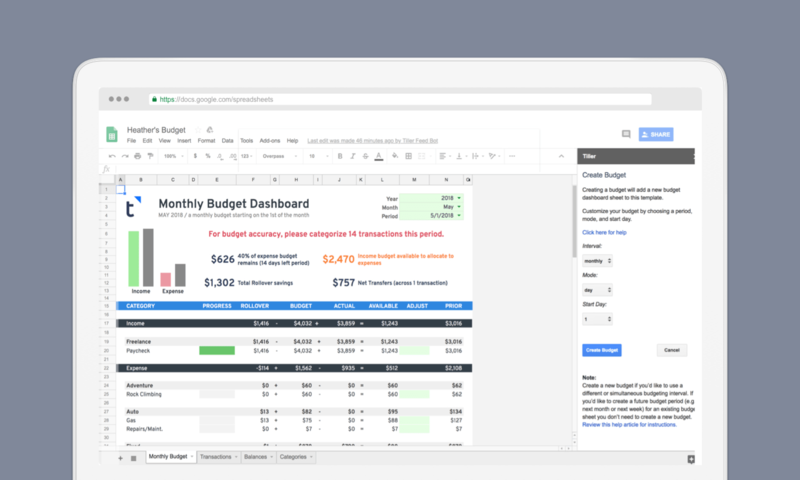 Introducing the all-new Tiller Budget, a complete budgeting solution for Google Sheets with powerful new features and the only automatic feed of daily financial transactions piped directly into a spreadsheet. By connecting Google Sheets to over 16,000 banks, credit card companies, brokerages, and loan accounts, Tiller Budget makes managing money in a Google Spreadsheet 10x faster. Tiller originally set out to build a better financial app. But company research kept finding that the most financially engaged people used spreadsheets to manage their money. That’s because spreadsheets are powerful enough for any financial task. And they’re customizable for every step of the financial journey. Even in our age of chatbots and apps, 25% of Americans rely on a spreadsheet at least part of the time to manage their money. Rollover capabilities unlock new abilities. Support for envelope & zero sum budgeting. Set savings targets and track savings goals. Automatic budget archiving and dynamic period recall. Edit past and future budgets without affecting your current budget. Dynamic shortcuts to adjust budgets and rollovers in the budget dashboard. Use multiple concurrent budgets in a single spreadsheet. Spending and saving categories are the foundation of every budget. Tiller empowers people with complete control over their own categories – no other automated tool comes close. Hands-on control with a touch of automation. Financial experts agree that tracking spending is the first and most important step in keeping an effective budget. Custom categories and automatic transaction import make tracking spending in a spreadsheet incredibly easy – and even fun. Tiller Budget is the only Google spreadsheet template with the power of automated rollovers, so users will always know where their category balances stand. With automated rollovers, it’s never been easier to use the popular zero-sum and envelope budgeting strategies in a spreadsheet. Tiller Budget is the most accurate way to follow either method in Google Sheets, because it’s powered by actual daily spending transactions. The rollover capability in Tiller Budget provides an elegant solution for managing savings goals. It’s as simple as choosing a category and deciding how much you want to save, or otherwise rollover into a different category. Easily track progress with the savings goal indicator in the dashboard. We’re introducing shortcut commands to make dynamically adjusting budgets and rollovers quick and easy. The shortcuts facilitate moving money from categories where you have extra budget or rollover to ones where you’re overspending or need to save. It all comes together in the Budget Dashboard, with powerful tools to visualize rollovers, show how many days are left in your budget period, track progress, view graphs of income and expenses, track spending in each category, and view actuals of what’s spent and what’s left. All with a vibrant, clean UI that makes working in a spreadsheet easier than ever. Tiller Budget is Tiller’s first template delivered via an add-on. This makes it easy for Tiller to push updates when new features are released. Simple, easy-to-control collaboration is one of the best features of Google Sheets. Anyone with Tiller Budget can safely share access with a spouse, business partner, or financial advisor. Unlike free templates, Tiller Budget is supported by a staff of developers and a team ready to ensure your success. Tiller Budget also includes an extensive library of help videos and docs as well as an optional budgeting course to get started. Tiller Budget is available now. Try it absolutely free for 30-days. It’s $59 per year following the 30-day trial. Tiller has one of the strictest privacy policies of any online financial service. Your private data is just for you. Even the Tiller support and engineering teams don’t have access to customer transactions and balances. We never serve ads based on financial data.